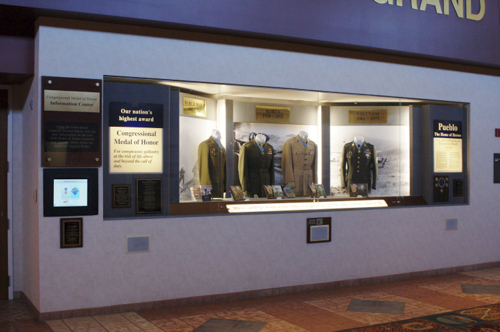 The Medal of Honor Display Case in the Grand Hall of the Pueblo Convention Center was designed to honor Pueblo’s four Congressional Medal of Honor recipients, Raymond “Jerry” Murphy, Drew Dix, Carl Sitter and William Crawford and was installed and dedicated in 1997. This display was designed by Pam and Doug Sterner. It has been a popular and dramatic feature of the Convention Center as it tells the story of the actions that lead to the four recipients receiving their medals, plus showing their uniforms and replicas of the medals. 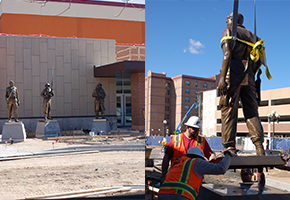 The original display, and the new upgrade, were made possible by the generous contributions of the Richard Leach family, the City and County of Pueblo, The Pueblo Urban Renewal Authority, John and Nadene Verna and the Pueblo Home of Heroes Association. A touch-screen computer terminal has been installed in the wall to the left of the display that will allow people to bring up and view the names and action details of all Medal of Honor recipients, which is over 3,400. The database that provides this information has been compiled and created by Doug Sterner, local military historian and webmaster for the very popular www.homeofheroes.com web site. The Congressional Medal of Honor is the United States highest military medal and has been awarded to fewer than 1,000 men out of the more than 8 million who have served in our military since World War I. 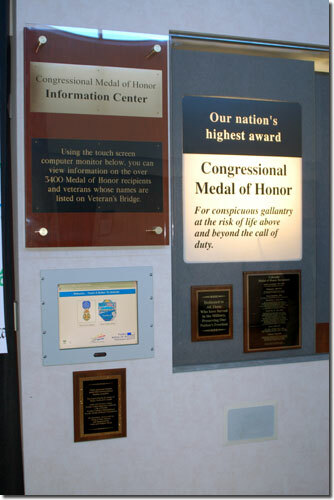 Now the computer has been updated to include the Veteran’s Bridge honorees at Pueblo’s Historic Arkansas Riverwalk. Several hundred veteran’s are logged in so far with the hopes as the Veteran’s Bridge Project expands so will the data base that will allow you to see the photos and biographies of Pueblo’s veterans.